Warning: some readers may find this entry long and tedious; if so please move on! Saturday night's tagliatelle au saumon at Pizzeria Vecchio took a bit of getting through after our mid afternoon giant lunch. But I manfully consumed it, as an intrinsic part of the training plan laid down by Sue. A plan that involved no running at all. It was two late for that. If I'd known Alistair hadn't bothered with anything else after the carbo loading lunch, I may have managed with just a pasta salad from the Monop' shop. Anyway, after a couple of croissants and a cup of coffee for breakfast I made my way down to the start for soon after 9. There was lots of security, so meeting up with Alistair was a bit fraught, and handing over fleece and valuables to Laurence had to be done after we'd started. Ali and I ran together for about the first 10 km, tracking the 'yellow sails' of the 4 hours 30 minute pacers. Ali finally went ahead of them, as did I after stopping for a pee and deciding a drink every 5 km was sufficient. The pacers were stopping at every drinks station - at 2 to 3 km intervals. We were going at a pace of about 6 minutes per kilometre for the first hour. Conditions were good - not to hot, with a breeze to evaporate the sweat. There were no steep hills, though the course did undulate. My GPS, usually pretty accurate, shows ascent totalling a modest 200 metres for the entire course. I happily jogged along for a second hour, passing the 20 km marker after a little over two hours. Keeping to that steady pace was however becoming harder, and the half way point hadn't been reached. The official timing shows me reaching half way after 2 hours 10 minutes. I did the Macclesfield Half Marathon seven years ago, again with no training, so I'd known that barring injury I could keep a steady pace for that distance. But now I was in new territory. I soon passed Alistair, who had moved into a run/walk mode. I was managing to maintain a pace of just over 6 minutes per kilometre. I was passing lots of people, breathing deeply from time to time, and munching a pocket full of jelly babies. That made me feel queasy so I switched to grabbing bananas at the frequent support points. "Allez Martin, bon voyage" or similar. After 30 km I continued to run but my pace slowed, and at 35 km I had to accept that I couldn't physically run the whole distance, so I briefly lapsed into a walk. Friends had advised that if I found I couldn't run any more it would be an easy transition to a fast walking pace. Not after running for 35 km I'm afraid. So after about 20 metres walking, I relapsed into a slow jog, marginally quicker than a moderate walking pace, that was just as easy as walking apart from the need for lots of very deep breaths. With about 4 km to go the yellow sails of the 4 hours 30 minute pacers went past. I wonder how I would have got on if I'd stayed with them all the way? Who knows? I might have expired like one of those yellow pacemakers that I passed near the finish. With gritted teeth and occasional pauses for drinks and a few metres of walking, the run continued. I didn't particularly enjoy this bit, but the mutual encouragement and camaraderie helped. There was one long avenue where runners stretched ahead into the far distance that was particularly tedious, especially as by now the leading relay teams had started to come flying past. Near the end - maybe 500 metres away, though you couldn't see the finish (I knew it must be imminent as my GPS said we should have finished) I was given a push by a younger competitor. Vincent Carlier cajoled me into speeding up to the fastest pace I'd managed in the entire race. Every time I slowed he slowed with me and pushed me to an even faster pace. The orange carpet soon arrived and I'd like to think that was where we overtook one of the elite relay teams. Thank you Vincent, whilst I didn't particularly enjoy it at the time, it was a memorable finish. Just desserts I suppose, as from time to time I've done the same to a few parkrunners in an effort to push them to personal bests. I finished at well inside 5 minute kilometre pace for that last 500 metres! Getting out of the race compound was a bit of a struggle. I was later glad I'd eschewed the plentiful food on offer as I was still a bit queasy. I found a bollard to stand on and attempted to record Alistair rounding the final corner. Laurence and Monique were cheering us both on, though as I was distracted by Vincent I hadn't seen them at the end. Here are a couple of relay teams going through, with Alistair just behind them, gritting his teeth to reach the finish. 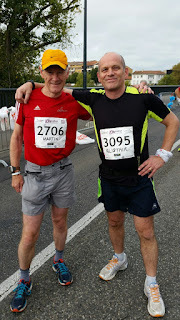 Our times are somewhat academic as we aren't exactly elite runners and neither of us had done any training, though I'd probably had more exercise recently than Alistair, who works full time as a teacher in France near Geneva. Martin: 4.32.40 (Half was 2.10) The ‘official time’ is a couple of minutes longer as that takes no account of the two minutes it took us to reach the start line. Position 2067 out of 2637 participants, and 48th out of 78 in my 60-69 age group. Alistair: 4.52.35, position 2378 (Half was 2.09). We all met up, Guy appearing from somewhere, and I nipped back to my hotel for a shower before we took the subway to Ramonville for an excellent Sunday lunch with yesterday's team at Laurence's mother's house, where we were joined by Didier's son Florian. Alistair and I were keen to absorb some of the Corsican beer that was on offer, and to show off our medals in the afternoon sun. A trip to a spacious park next to the Canal du Midi provided Ali and me with an opportunity to loosen up (it worked) and a chance to meet Guy's son Jerome and his family (Corinne, Matis (5) and Romane (2)). Lyra was also there, and she won a hastily convened Dog Hurdling Championship. Well done, Lyra. By the time we left the Canal du Midi, the light was waning. Then it was back for a welcome cup of tea at Monique’s house before returning to Hotel Ours Blanc for a good sleep before the journey home. When I started this project a month ago I thought I might raise just as much money for the Cape Town township schools by sitting at home and writing out a cheque equivalent to the cost of this trip. But the response and the donations have been amazing. I've increased the target four times, and as I write the donations from 93 people amount to £1748, with a bit more to come. Thank you so much. I didn't know I had so many friends! There’s a slideshow covering my whole trip, here. If you click on the first image you may be lucky enough to be able to scroll through the pictures and see the captions, but if you find the ‘slideshow’ setting you are unlikely to see the captions. Google really are in a mess with this, I’m going to try alternatives when I have time. PS Here’s the route, different from previous years, I believe, perhaps for security reasons. And here’s the Garmin download giving timing splits, etc. The Toulouse Marathon - I finished! We both finished. My time was about 4 hours 32 minutes. Success, and only painful for a relatively short period (I hit a wall at 35 kilometres).